"Tomorrow, with your votes, you can stop the radical resistance in its tracks," Trump announced, adding that "Tuesday is your chance to send a message to the Democrat mob and to everyone who has made it their mission to denigrate our movement and to divide our great nation." 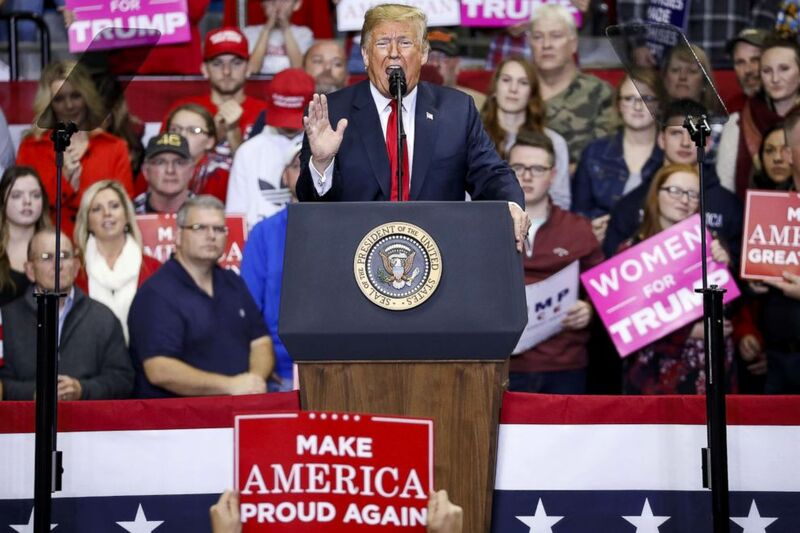 Trump supporters in the Buckeye state turned out in droves to hear the president's closing refrain before election day, as early voting figures across the country have already eclipsed 2014 totals in many states. But that didn't keep Trump, who has two more campaign stops in Indiana and Missouri tonight, from encouraging his supporters to get out to the polls. "I remember with [my election], this is very much a Tuesday state. The people are sort of holding for Tuesday," Trump said after asking the audience whether they'd already voted. "The midterm elections used to be, like, boring, didn't they? Who ever even heard of a midterm? Now they're, like, the hottest thing." Ohioans overwhelmingly supported Trump in 2016, so with Republicans facing a tough slate of gubernatorial, Senate, and House races this cycle, it's no surprise the president chose to be in Cleveland on his last day of campaigning. And if there was any doubt that this election is all about Trump, he made that clear. "In a sense, I am on the ticket," Trump said. Trump heaped praise on Mike DeWine, the state's current attorney general and Republican candidate for governor, who is deadlocked in a neck-and-neck race with Democrat Rich Cordray, the former director of President Obama's Consumer Financial Protection Bureau. DeWine has sought to garner support from Trump's wing of the GOP while maintaining ties with a moderate block aligned with the state's current governor, John Kasich - a frequent critic of Trump. President Donald Trump acknowledges supporters during a campaign rally in Cleveland, Nov. 5, 2018. "He's fighting, he's great," Trump said of DeWine, before turning his attention toward Cordray, who he called a "bad guy." "I know his opponent -- he’s a bad guy, not a good person. He’s hurt a lot of people. Cordray, a bad person who will do a terrible job," Trump told the crowd. Cordray, in a recent campaign ad, expressed a desire to do what's best for Ohioans. "When President Trump does something that helps Ohio, I'll work with him," Cordray told viewers. "But when he does something that hurts Ohio, I'll stand up to him. But Mike DeWine backs Donald Trump every single time, no matter what." If Trump is trying to push DeWine over the goal line, his endorsement of Rep. Jim Renacci, a U.S. congressman challenging Democrat Sherrod Brown for a seat in the Senate, is nothing short of a Hail Mary. Polls suggest Renacci trailing Brown by a substantial figure, with 538 giving Renacci a 1 in 30 chance of winning. Nevertheless, Trump hailed Renacci as "a wonderful human being" who has "run a really good campaign," adding, "it’s not easy." In addition to his kind words for Republicans on Ohio's ballot, Trump nailed his well-worn stump speech, highlighting the booming economy, bemoaning the migrant caravan and boasting of his successes in confirming two Supreme Court nominees. Trump spared a moment for his daughter, too, inviting Ivanka Trump onstage by joking with the audience that he isn't allowed to call her "beautiful" anymore. "You’re not allowed to use the word beautiful anymore - it’s politically incorrect. So I’m not allowed to say it. But she's really smart. It’s my daughter Ivanka, and she’s here!" Trump announced. "That was some introduction!" Ivanka chided, before going on to highlight a laundry list of the administration's accomplishments. From Cleveland, the president takes Air Force One to Fort Wayne, Indiana, before closing out his 2018 campaign stretch in Cape Girardeau, Missouri, Monday night. 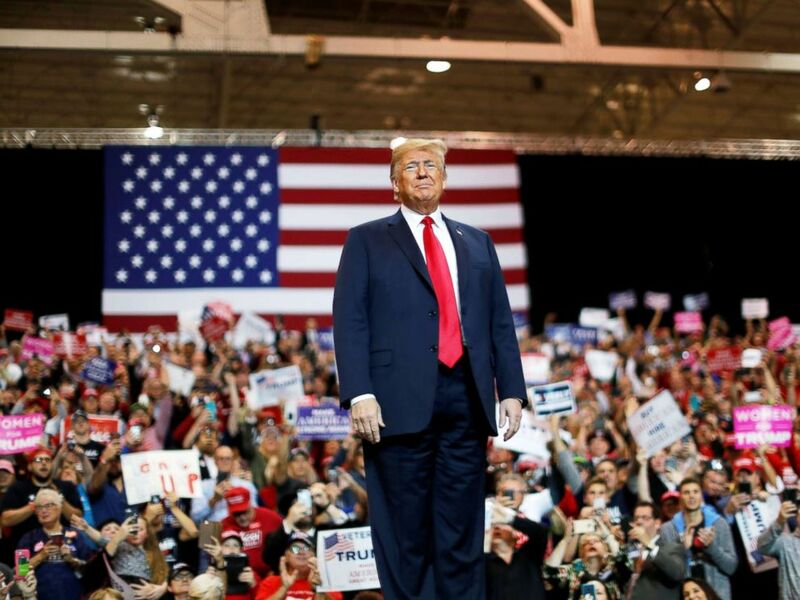 Less than three hours after leaving his rally in Ohio, President Trump took the stage before nearly 13,000 supporters in Fort Wayne, Indiana, the second of his three last-day stops to boost Republican midterm turnout. Though the penultimate event largely echoed the common rally theme of depicting Democrats as an obstructionist party trying to bring chaos, while crediting Republicans with bringing order through a strong economy and strong borders, in Fort Wayne the president took time to focus on Republican Senate candidate Mike Braun. "Tomorrow the people of Indiana are going to send Mike Braun to the U.S. Senate," Trump said of the businessman-turned-candidate, adding later that it would be "a vote to keep your family safe." Braun is running a tight race against Democratic incumbent Sen. Joe Donnelly, this in a state where Trump beat Hillary Clinton by 19 points in 2016. The president implied Donnelly, whom he called "an extreme liberal," has been pretending to support him to get votes. President Donald Trump speaks during a campaign rally for Republican Senate candidate Mike Braun at the County War Memorial Coliseum, Nov. 5, 2018, in Fort Wayne, Indiana. "He’s gone rogue on the Democrats, he’s gone rogue, because now he likes Trump a lot, he loves my border policy," the president said. "There’s one problem," he added. “We’ll have the election tomorrow, and on Wednesday he’ll be totally against us." Despite Donnelly's lean to the right on some issues including immigration and bank deregulation, former President Barack Obama came to Indiana the day before Trump to campaign for him. Former Vice President Joe Biden also made the trip to support the senator in October. Even before the high-profile visits from Trump and Obama, early voting in Indiana had surpassed its 2014 total, as it has in dozens of other states. Several attendees at the Fort Wayne rally told ABC News they voted early this cycle to be sure their preference for GOP candidates would be heard, citing the Kavanaugh confirmation as well as the state of the U.S. economy and foreign policy as motivation -- all factors that could just as well motivate Democratic voters. Midway through his talk, Trump surprised the crowd by inviting White House press secretary Sarah Huckabee Sanders and counselor Kellyanne Conway on stage. "You'll have to forgive Kellyanne and I, we're maybe a little speechless -- we're not used to friendly crowds," Sanders said, to laughter from the crowd. Both women implored the audience to vote for Republican candidates, as Conway called the election a "very personal" matter for her. "Elections have consequences, and your vote tomorrow is so incredibly important," Conway said. "You've got to get everyone you know out to the polls tomorrow or it doesn't matter." Despite enjoying overwhelming support from the audience, the rally was paused three times due to protester interruption. Each time a protester was removed from the packed arena, the crowd would chant Trump's name, and Trump would tell the protester to "go home to mommy!" "I haven't had one of these things happen in a long time, and I have three of them tonight," Trump said. "That's Indiana for you." Trump ends his long string of pre-midterm rallies Monday evening in Cape Girardeau, Missouri, where pundits Sean Hannity and Rush Limbaugh are expected to attend. President Donald Trump held his 44th rally of the 2018 campaign cycle Monday night, submitting the GOP's closing message in the Show Me State, where he laid out the stakes of Tuesday’s highly anticipated midterm elections. "We have to get out tomorrow, and we have to elect a Republican Congress," Trump proclaimed, warning that a Democratic Congress would socialize health care. In his third rally of the day, Trump campaigned on behalf of GOP Senate hopeful Josh Hawley, who's challenging incumbent Democratic Sen. Claire McCaskill in one of the election's most closely contested races. "Tomorrow, the people of Missouri are going to send Josh Hawley to the United States Senate to keep America's economic boom going full speed ahead," Trump told the crowd. "Josh is a young, incredible guy with tremendous talent. He will represent Missouri so well, and he's actually leading." The president repeatedly bashed McCaskill, asserting she "will be a disaster for jobs, for your state." Despite heavy rains drenching the region Monday afternoon, thousands of Missourians packed the Show Me Center for the rally and did not let the gloomy weather dampen their enthusiasm, chanting "four more years" and collectively singing "Amazing Grace" as a woman who collapsed near the stage was tended to by emergency personnel. Trump is the first U.S. president to visit Cape Girardeau since Ronald Reagan in 1988. Trump won Missouri by 20 points in 2016. "Go out and vote Republican tomorrow," said Trump, wrapping up his speech as midnight approached on the East Coast. "This Tuesday, in 15 minutes -- we're almost into Tuesday -- I need the people of Missouri to seize this incredible moment in history." Trump campaigned across 22 states this year, including three stops in Missouri: Springfield, Columbia and Cape Girardeau. The president is expected to monitor election results from the White House today. ABC News Live -- the network’s 24/7 streaming channel for breaking news and live events -- will offer continuous and commercial-free coverage on Election Day starting at 4:30 p.m. EST on Roku, AppleTV, Amazon Fire TV, YouTube, Apple News, Facebook, Twitter and the ABC News site and mobile apps. ABC News will provide comprehensive coverage, analysis and race updates on ABCNews.com, FiveThirtyEight.com and GoodMorningAmerica.com. The daily newscast "On Location" will feature segments on the midterms before, during and after Election Day -- exclusively on Facebook Watch.